Holy Gumballs! 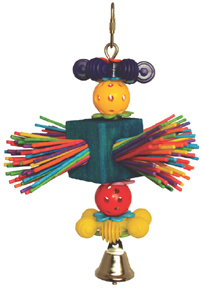 is sure to be a favorite with your stick picking, chewing, loving birds ... it's a smaller version of the Kooky Kaleidoballs toy!! The two mini whiffle type balls are about 1" diameter and the colorful, a.75" square wooden center "body" is filled with lollipop sticks for parrot peeling fun. A pear shaped quick link on top for easy hanging and a bell on the bottom for a ringing good time. A swinging, colorful fun addition for your mid to larger sized beaks! Our parrots love these stick toys ... this is a new one to share with your feathered family!